Many people now work from home. If you are one of them, you will want to make sure your home office is an inspiring and productive place to work. Part of this comes down to making minor changes to the design and decoration of your space. Although they may be small, they can make a big impact. Adding some brightly colored flowers is probably the quickest and most effective way to transform your home office. Floral arrangements not only look stunning but they also improve the air quality and provide the surrounding area with a pleasant aroma. You could make an effort to change your floral displays each week or two, or you could invest in some hardier plants like cactuses that will provide you with pleasant greenery without requiring much care. So if you really are short on time but you want to make a big difference to your office, use flower power and see an immediate improvement. Another quick and simple way to instantly improve your home office is to add some paintings to the wall. There is a limitless range of artwork you could use in your home office, but just make sure that you choose artwork that provides inspiration without becoming a distraction. And don’t just stick up paper copies directly onto the walls. Find some quality framed paintings that will look stunning. Look for artwork that is original, perhaps from independent artists like the paintings you’ll find at follio.com, as this will make all the difference. You need to go beyond the physical decoration of your office if you want to make it into a truly productive and inspiring place to work, and this comes down to using the right type of lighting. Natural light is always the best option, so if you can work next to a large window, this is ideal. However, you will probably use your office after dark, and an attractive lamp or overhead light can make a big difference. A bright bulb is ideal to help you concentrate, but a softer light may be more suitable in the evening. Choose something that suits your style, whether that is vintage or ultra-modern, and let it inspire you. Your desk, chair, computer, shelves, and keyboard all have a big impact on the look and feel of your work area. They can also affect your physical comfort while you work. 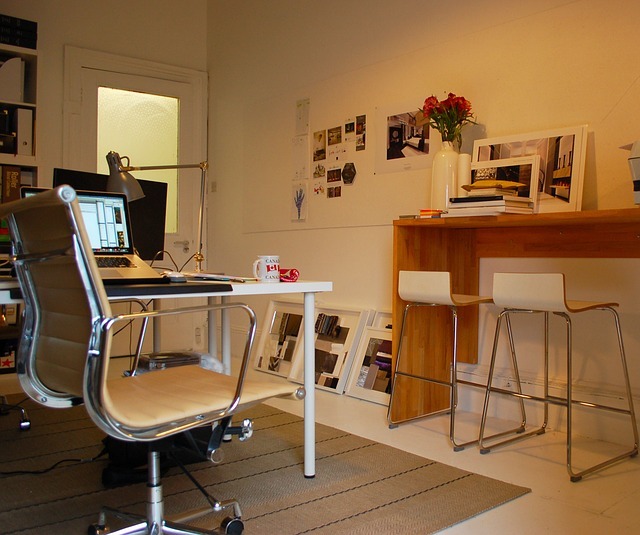 If you are not comfortable at your desk, consider switching up your furniture and equipment. Not only can it help you to work in comfort, but it can also make a big visual impact on your workspace, which can help to make you keener to spend more time there. There is no point in working from home if you are constantly miserable. Your home office is a place where you should put in a lot of effort to make sure it is not only comfortable but also inspirational. So use these quick tips to make a big difference to your office in no time at all, and enjoy the benefits for a long time to come. Louise Stephens is an interior designer. She writes about decor in her articles, offering up some helpful hints for turning a dull room into a fab yet functional one by adding a splash of color and some artwork.